I'm sure many of you must've admired the beautiful decorations made on cakes and sighed with envy. And though decorating with frosting is an art, there are ways by which even a novice can create exquisite patterns and designs on cakes and desserts, thanks to the very powerful and very handy use of Marzipan. Primarily made from Sugar and Almond Meal, Marzipan has been used for centuries by pastry chefs all over the world. It can be used in baking and for covering and filling cakes, or to make fabulous figurines like those pictured above. [Photo courtesy of cybaea; published under a Creative Commons License]. Marzipan-filled Chocolates, and miniature Fruits & vegetables made from Marzipan are very common, especially during the holiday season. If you are looking for a hassle-free recipe, here's one that I liked over at Gingerbread-House-Heaven. They use Karo Syrup and Marshmallow cream, which provide the stickiness and the consistency needed to knead the dough, without needing to boil the mixture. If you can find the ingredients, this is by far the best and the easiest Marzipan recipe. I was able to find Karo Syrup in Ranch 99 stores, so I believe you could get it in any Asian grocery store. Combine the almond paste, karo syrup, and marshmallow cream. Add the powdered sugar a small amount at a time. As the mixture becomes too thick to stir, knead in the rest of the powdered sugar until you have a pliable dough. If it's too sticky to work with (especially if hand-modeling,) add powdered sugar until it's firm but not dry. Sprinkle some powdered sugar over a marble slab, wooden cutting board, or large baking sheet. Fill your sink or a large bowl with cold water. Place the sugar and 2/3 cup water in a large heavy saucepan and heat gently, stirring, until the sugar dissolves. Add the cream of tartar and turn up the heat. Bring to a boil and cover, boiling, for 3 minutes. Now remove the cover, and boil until the temperature reaches soft-ball stage, 240 degrees on a candy thermometer. Place the bottom of the saucepan in the cold water you’ve prepared, stirring the sugar mixture constantly until it becomes thick and creamy. Stir in the ground almonds and the egg whites, then place back over low heat and stir for 2 minutes more until the mixture is thick. Spoon the marzipan onto your prepared work surface, and turn it with a metal spatula until it cools down enough to touch. Coat your hands in powdered sugar and begin to knead the marzipan, working it until it is smooth and pliant. Your marzipan can now be used immediately or stored by wrapping it in plastic wrap and keeping it in an airtight container. My Notes: I found the Quick-fix version to be a better alternative, and the resultant Marzipan was much easier to work with. I have tried the traditional recipe above before, and though the consistency achieved is more smoother, it tends to get a bit more sticky when you try to shape it. So you might have to use more flour while working with it. However, chilling the dough for a sufficient amount of time helps quite a bit. The Quick-Fix recipe works well for shapes and for covering small cakes, but be prepared for the distinct flavor of Karo syrup in the dough; the Marshmallow adds a nice creamy taste to the Marzipan, which I liked. 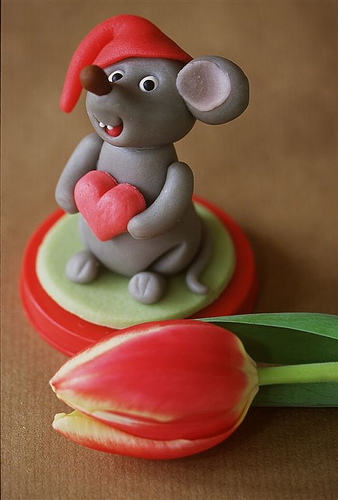 Marzipan can be molded by hand, rolled flat and cut out with cookie cutters, or it can be pushed into candy molds to make easy and consistent shapes. Chill the marzipan in the mold to make it easier to remove from the mold. You can mix this marzipan recipe with a small amount of fondant to make a lighter colored dough with less of a strong almond flavor. Use edible food colors to paint details on your marzipan figures more realistic. For instance, a little brown coloring on half of a pear, streaks of brown down bananas, reddish-orange painted on 1/2 of an orange colored peach. Cloves can be used to make stems for many fruits. Marzipan decorations stay for a much longer time, and taste great! So this holiday season, as you try to bake some beautiful cakes, keep Marzipan in mind; it can be a great substitute for frosting, and will be much easier to work with. Hope this makes some of your holiday baking a bit less strenuous! Yummy!! Even I would to try it. nice variation, good idea, i think the mice very cute. Marzipan is one of those things that I always assumed can't be made at home. Thanks for the recipe! I can't wait to try your easy recipe for Marzipan. All you recipes look so good I subscribed. Thank for the info. Hi, first time to your blog. You have a wonderful space and good, interesting recipes to follow. Following you. Thanks for the recipe. My little sister is bothering me since Christmas, that she wants to make her own Marzipan and I had no idea where do find a recipe. I thought it was something complicated. It seems my sister will be happy to learn that she can stop being annoying and start making up for it by making and giving me some Marzipan. nyc post...i wud like to ask the subsitute for cream of tartar? ?